Still, the killings raised fears about Toronto’s vulnerability to a terrorist attack. The marauding van evoked memories of deadly vehicle rampages carried out by extremists in a number of major Western cities in recent years, including New York, London, Stockholm, Berlin, Barcelona and Nice, France. He was dressed in a white jumpsuit with his hands cuffed behind his back. Seven uniformed police officers surrounded him in the hearing room. A man who appeared to be Mr. Minassian’s father attended the hearing but offered no comment to reporters other than saying he had not spoken with him. Witnesses and amateur cellphone videos that captured the rampage and the suspect’s arrest showed a horrific scene that traumatized Toronto, a showcase Canadian metropolis. 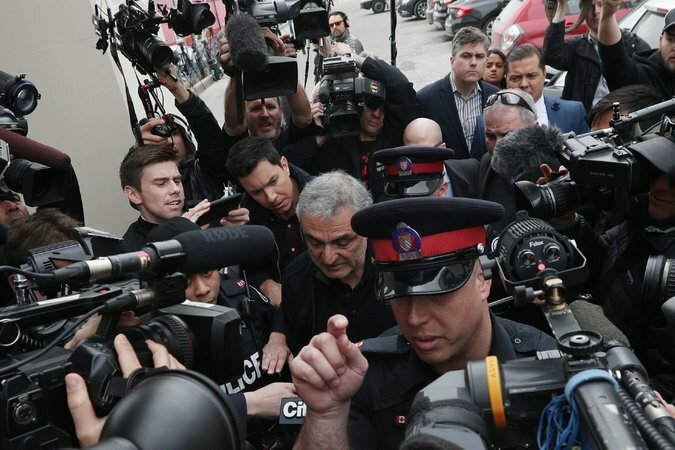 Vic Minassian, the father of the suspect, Alek Minassian, attended a court hearing on Tuesday but offered no comment to reporters other than saying he had not spoken with his son. Around 1:20 p.m., Mr. Alce said, his initial disbelief turned to shock and then horror as the speeding van cut through the intersection, mounted the curb and began to swerve and mow people down. Mr. Alce, for his part, went to see whether could help, rolling over some of the victims to see whether they were alive and administering CPR. As well-wishers continued to gather at an impromptu memorial near the scene of the attack, hazardous material cleanup teams wearing respirators and jump suits were using absorbent powder to remove bloodstains from the sidewalk.